This is a good review of Thévenin / Norton power sources and their equivalencies. This is a good review of current sources and parallel resistances. At first it may seem a bit overwhelming to derive an equation from these steps, but it is actually easier than it looks. A hint on how to do it: begin with the last step of the circuit simplification process, and work backwards as you elaborate your equation. What do you notice about the output voltage of this circuit? 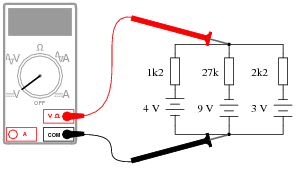 What mathematical function does this circuit perform? 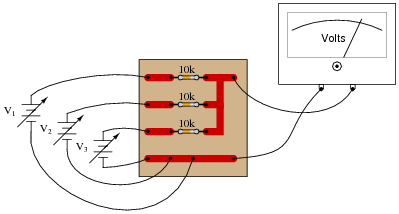 This circuit is a very simple form of analog computer, because it has the ability to perform a mathematical operation, with voltages representing numerical quantities! Not only does this simple circuit provide an excellent opportunity to practice using Millman's theorem, but it also illustrates the important principle of using resistor networks to perform mathematical functions. In essence, this circuit is a form of computer (an analog computer), capable of "calculating" at a rate of speed unmatched by any digital computer. Ask your students to think of the advantages an analog computer such as this would have over a digital computer, and visa-versa. How come analog computers are seldom used, and digital technology is so prevalent? Does this mean analog computer technology has no place in modern electronics? What do suspect is wrong with this circuit? How would you verify the cause of the incorrect output voltage? The upper resistor is failed open. Note how even with a failed resistor, the circuit still performs the proper mathematical function (albeit, only regarding two of the input "channels" rather than three). Ask your students how they determined the source of the problem, and how they would verify that as being the fault, with just a single meter measurement. 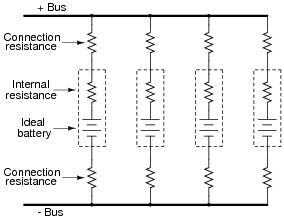 What would a digital voltmeter register, if connected to the circuit as shown below? If you calculated 3.797 volts, you made a mistake! In actuality, the voltmeter would register +1.235 volts. A very common mistake I've seen students make is to disregard polarities when using Millman's theorem. If this appears to be a common problem in your class, ask your students if they think reversing one of the voltage source polarities would have any effect on the "bus" voltage. Of course, it should. Once students understand that polarity is significant, they can arrive at their own consistent approach to accounting for polarity in the Millman's theorem equation. Another strategy for getting students to understand the significance of polarity when using Millman's theorem is to go back to the foundations of Millman's theorem: the principle of converting Thévenin sources into Norton sources. 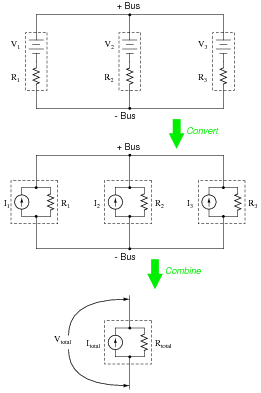 If a Thévenin source with a "backwards" battery is converted into a Norton source, that current source will subtract current from the rest of the current sources, leaving less to go through the total Norton resistance. Students should be able to readily understand the principle of Norton current sources adding versus subtracting, and this should then carry over into their use of the Millman's theorem equation. Millman's theorem is especially useful in making bus voltage calculations for power systems, where multiple sources (and loads!) are connected to the same two wires. Regard the starter motor itself as a 0.15 W resistor, and disregard any resistance of the jumper cables connecting the two cars' electrical systems together. For a question like this, where an equivalent schematic diagram is essential to obtaining the solution, I recommend you have a student draw their equivalent schematic on the whiteboard in front of the class, and discuss the diagram with all your students before discussing how to apply Millman's theorem. I have found it helpful for students to have them draw diagrams and mathematical solutions on a board in front of the rest of the class. Of course, you as the instructor must be careful to maintain a non-threatening environment in the classroom while students do this, as it tends to place a lot of stress on shy students. However, the ability to present graphical information to a group is a valuable skill, and exercises like this help to build it in your students.